Thomas A. Betts, Jr., was born in Rockingham County in 1941 but has lived in Rocky Mount since childhood. A graduate of East Carolina University, Tom returned to the area determined to make a difference. And, make a difference, he has. Hardly an endeavor or organization in our community has not been helped by Tom’s hard work and conscientious efforts to make Nash and Edgecombe Counties grow and prosper. As an early leader in the community, Tom took the lead for Nash Community College to establish an educational training facility to recruit Consolidated Diesel Company. Tom’s commitment and passion for North Carolina Wesleyan College made a direct impact on the sustainability and preservation of the college, earning him the prestigious Algernon Sydney Sullivan Award in 2007. Even the highway beside the college is named the Thomas A. Betts Parkway. 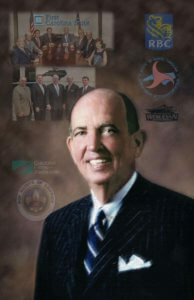 Tom represented the area on the North Carolina Transportation Board from 2003 to 2008, served as chairman of the Carolinas Gateway Partnership for eight years, and currently serves on the board of the Gateway Technology Center which has dedicated its building to his vision to bring educational opportunities to area residents and businesses. Mr. Betts and his wife Mary Davis have two daughters, Farrar and Kathryn.